Las Vegas (March 7, 2017) – 8-Time world champion Thomas “The Hitman” Hearns has confirmed that he will appear and have a booth to Meet & Greet his fans at the Las Vegas Convention Center for the 3rd edition of Box Fan Expo that will take place Saturday May 6, 2017 during Cinco De Mayo weekend. The Boxing Expo will also coincide with the mega fight between Canelo Alvarez vs Julio Cesar Chavez jr, that will take place later that evening. Hearns returns once again at this years’ Expo and will be signing gloves, photos and selling merchandise. Fans will also be treated to interactive games and taking pictures with The “Hitman” at his Rock Jaw booth. He joins the list of over 50 current and past World Champions boxers who have appeared at the Expo, meeting their fans in person. Hearns more famously known as “The Hitman”, became the first boxer in history to win world titles in four divisions. He would also become the first fighter in history to win five world titles in five different divisions. Hearns was named Ring Magazine fighter of the year in 1980 and 1984 and is best known for his fights with Sugar Ray Leonard, Marvin Hagler and Roberto Duran. He was inducted into the Boxing Hall of Fame in 2012. 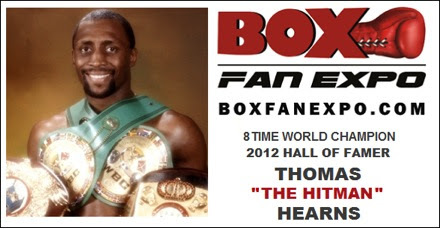 Thomas Hearns joins Kronk, WBC, Christy Martin, Mia St.John, Fernando Vargas and Joel Casamayor among early commitments to this year’s Box Fan Expo.